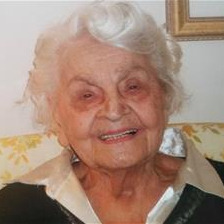 Marguerite J. Thomas, 99, passed away Thursday, March 21, 2019 at Lakeview Village. Visitation will be 5:30-7:30 PM Wednesday, March 27 at Porter Funeral Home, 8535 Monrovia Street, Lenexa, KS. Funeral Services will be 10:00 AM Thursday at the funeral home. She was born November 29, 1919, in Kansas City, KS to Marshall and Alma Leffler. She graduated from Wyandotte High School, attended Business School in Kansas City, MO and took Accounting, Business Law and other subjects at KU, UMKC and JoCoCC. She studied piano, voice and dance at the Horner/ Holt Conservatories in KCK and taught piano there for 4 years. As a teenager she learned to fly at the Fairfax Airport in KCK. She also studied art at the KC Art Institute. She married Edmund Thomas, Jr. in 1942. In 1952 she started her own Accounting Firm which she operated until 1989. In 1953 she became an Office Manager for Buchanan Bros. Construction Co. in KCK until 1978. In 1976 Eddie and Marguerite built a home in Shawnee, KS where they resided until after Eddie's death. She was an Enrolled Agent under the IRS, a past member of the Public Accounts of Kansas, National Pub Accountants, Hope Lutheran Church, Phi Mu Gamma. She was preceded in death by her husband, parents, brother Arthur Leffler, sons Mark and Eddie Thomas, sister Alma Lorfing. Survivors include her sister Alice Robinson, daughter-in-law Kay Thomas, 3 grandsons; Eddie (Angela), David (Kristi), Gregory, 8 great grandchildren, 7 great great grandchildren and many extended family and friends.